Alan C. Brawn CTS, DSCE, DSDE, DSNE, ISF, ISF-CLCD flat panels continue to evolve–with thinner profile displays, thinner bezels/mullions, and LED backlighting developments. And there continue to be innovations in non-LED videowalls, OLED and a variety of display technologies. There have never been so many choices available for the market. How did we get here? The modern history of liquid crystals has been dominated by the development of electronic displays. These developments began in 1964, when the scientists at RCA Laboratories discovered the reaction characteristics of liquid crystal molecules and that they could apply to display technologies. From that point on, what we now consider standard LCD technologies were developed. In the beginning, liquid-crystal displays (LCDs) were limited to niche applications such as small-size displays for digital watches, pocket calculators, and small handheld devices. That all changed with the development of the notebook computer industry. In 1988 Sharp Corporation demonstrated a full color and full motion active-matrix 14-in display using a thin-film-transistor aka TFT array. As they say, the rest is history. It was understood by all in the display industry that LCDs would be used to replace the then-existing cathode ray tubes. It has taken nearly twenty years of developments year by year but the scientists back in 1964 would be proud of how far we have come. Fast forward to 2012. First let’s get the obvious stuff out of the way. The first development we all see is the thinner and thinner bezels on flat panel displays. The started out in early examples with bezels a couple of inches in width but now the Samsung UT-2 Series for example features a bezel measuring just 2.4mm on the bottom and right, and 4.3mm on the top and left (for a total bezel width of 6.7mm). With the thinner bezels and declining prices we are seeing videowall applications as the beneficiary. Forecasters are talking about a four-fold increase in videowall sales over the next couple of years. Couple thin bezel designs with built in videowall processors from major companies like Samsung and NEC among others not to mention technology breakthroughs in software based outboard processors like Hiperwall, and this segment is to be kept in close focus. By the way, there are a couple of reasons we do not (yet) see zero bezel LCD displays. The first reason is the stability and protection of the panel edges and the second factor is the need to have electronics around the edge of the display and since LCD is transmissive in nature where the light transmits through the LCD pixel structure to the viewers the surface cannot be blocked. The next phase in the bezel thinness battles will be an optical illusion. Certain manufacturers (sorry about the NDA folks) will come out with what looks like a zero bezel display. It will be a special type of glass substrate on the surface that literally wraps around the very thin edge of the display and transmits the image in what appears to be zero bezels on all sides. DynaScan has LCD flat panels at 2,500 and 5,000 nits. This enters the realm of pure LED display brightness in outdoor displays and the magic is that they maintain color and contrast in a design that looks like any other flat panel display.Another important trend is the almost universal migration away from the traditional CCFL backlight to the new and much more energy efficient and eco-friendly LED illumination arrays. In addition to the energy savings, LED arrays can be “tuned” (manufactured) to transmit light in terms of color space in a much more tightly controlled manner. The net result is that LED displays give you better colorimetry and contrast than the former CCFL equipped displays. LED array illumination comes in two formats and both have advantages. The first format is the edge lit array. This is extensively used in laptops and in most entry level large flat panel LCD displays. They have the benefit of being less expensive but still have the majority of the benefits of the more expensive full backlight LED arrays. The full backlight versions have the added benefit of controlling individual areas inside the boundaries of the image that is being displayed. In addition you have local area dimming which really improves contrast. My only complaint in the adoption of LED illumination is that the manufacturers are marketing it as an LED display and in fact it is not. This simply confuses the uninitiated but I guess we just have to chalk that up to marketing hype. While we are on the topic of illumination there is no better time than the present to discuss light output. Most people pay no attention to this factor but we are seeing great strides in this area. Why is this so important you ask? All of us have seen incredible images on screens in dark environments like a movie theater but the minute we raise the ambient light in the room then the pictures fades away. In the distant past we only had projectors and they produced 130 lumens of light output. The room had to be dark or very dim. Today we have thousands of lumens or in some cases tens of thousands to cut through ambient light with projectors but no so flat panel displays. The fact is that there is a need for flat panels to overcome higher ambient light in order to maintain picture quality just like in video projection. Up until the last few months we were mired down in the world of low brightness flat panels. The ubiquitous 40 inch LCD produced 400/450 nits of light output. This was and is fine for darker rooms or where ambient light can be controlled with some degree of success but where this is not possible more light output is needed. What prevented this from happening earlier was the design of the LCD flat panels from a core technology perspective. If the display was left on for more than half a day, the pixels would heat up and in extreme cases they would produce what is called image retention or energy retention. It looks a lot like plasma burn in but in fact is a different phenomenon. It is trite but true that necessity is the mother of invention and the folks at Samsung developed the first 24/7/3645 LCD panel design with heat dissipation layers to allow the excess heat to dissipate and not affect the panel performance. Not only did this prevent the negative effects of heat, it allowed them to increase the light output to 700 nits. Companies like NEC and Sharp among others have followed suit with brighter panels with protection against image retention but development has not stopped here. There are some environments that have very high ambient light that cannot be controlled easily or at all and more than 700 nits is needed. You will see some 1200 and even 1500 nit products popping up at show like InfoComm and the Digital Signage Expo but wait, the story is still not done. The team at DynaScan has one upped the big guys and they have shown LCD flat panels at 2,500 and 5,000 nits. This enters the realm of pure LED display brightness in outdoor displays and the magic is that they maintain color and contrast in a design that looks like any other flat panel display. Now this is progress! The next stop on our journey is resolution. Most of us are familiar with resolution of 1366 x 768, 1200x800, and of course full HD at 1920x1080 which is all the rage. The new trend we are seeing is higher and higher resolution. The folks at NEC have a 30 inch flat panel with 2560x1600 resolution and the team at Mitsubishi has their 3840 x 2160 display at 56 inches diagonally. So the first question you ask is what difference does this make if the top video resolution is 1920x1080? The correct answer is that to the first order it makes no difference but looking deeper it might make all the difference. In the world of cinema we now have 2K resolution that is being increased to 4K and there have even been 8K resolutions projectors shown in Japan. Going from the giant screen to the personal devices we have the Retina displays on cell phones and tablets and they have higher and higher pixel density on screen to show more detail which is the ultimate goal of the higher resolution trends that we are seeing. My friend and display expert Ken Werner wrote a note from the SID show that precedes InfoComm. He reported that “Sharp showed a 32-inch, 4K x 2K LCD with oxide backplane. Sharp Senior Product Marketing Manager Dave Hagan said the oxide is stable, and customers are praising samples of the company’s oxide LCDs. The images shown at SID were certainly impressive.” We are not saying to rush out and buy a new mega pixel display but be aware that the trend is here to stay and will flourish as a differentiator from lower resolution displays as time goes by. For all of us LCD fans out there (and who isn’t?) we will see even thinner displays. We will also see higher brightness and higher resolution along with improved colorimetry thanks to LED illumination. We will also see specific models with slide-in computer modules and others with dedicated set back boxes that can double as media players and some will even be upgradeable. Before shifting gears to our last flat panel development, one last point is size options. The typical size of most LCD used in digital signage today is a 46 inch display. This has increased from a 40 inch only a year ago. 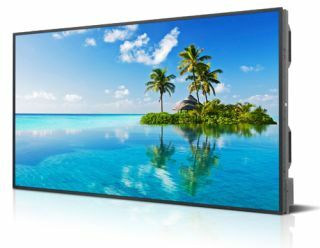 We think that a 50 inch display will be standard by the end of 2013 and the prices for 40, 46, and 50 inch displays will become even more completive in both feature and prices. The new battle ground and differentiation among models will be 60 inches and up with Sharp recently throwing down the gauntlet of a 90” display to go along with their 70 inch and 80 inch models. The larger sizes will impact the projection market but not eliminate it by any means so stay tuned as all of this evolves. At InfoComm 2012, Mitsubishi launched its new 46-inch LCD flat panel display designed for digital signage and corporate conference rooms. Built to international energy efficiency standards, the monitor is Energy Star-qualified and consumes only 126 watts of power through optimized power circuits.I have left the proverbial cherry on the sundae for last and that is an update on OLED. I am not violating the rules of the topic since OLED or organic light emitting diode is a kissing cousin to our traditional LCD displays. In fact this technology has active and passive versions not unlike LCD and goes steps further with flexible displays and heads up displays and…well you get the idea I am sure. OLED emerged in the 1980s from laboratories at Eastman Kodak in the US and Cambridge University in the UK, and was first commercialized in the late 1990s and we have been teaching OLED technology for some time in our advanced display technology courses but other than some limited use in cell phones and other personal devices it has not really been a factor in larger flat panel displays. Well, it looks like the time has come with key improvements from the folks at LG, Samsung, Sony, and a newly minted relationship between Sharp and Panasonic. OLED display technology now (finally) appears to be moving to compete in TV market with the new LG 55 inch OLED as the first major consumer application beyond cell phones. NPD DisplaySearch reports that, “organic light emitting diodes (OLED) technology advanced rapidly in 2011, a trend that they forecast will continue through this decade.” OLED technology has progressed in areas including organic materials, color patterning, electronic driving methods, and encapsulation; however, the ability to scale OLED to larger sizes has been a challenge until very recently and still not at the production levels of LCD. In fact the improvements in LCD along with the global economy have slowed the expected growth of OLED. From a performance point of view, OLED displays do not require separate illumination and can provide high contrast ratio, fast response time, wide color gamut, and wide viewing angle, while operating in a broad temperature range at low power consumption. In addition, OLED technology enables thin devices that can be both flexible and transparent. According to NPD Display Search “OLED display revenues were estimated to exceed $4 billion in 2011 (approximately 4 percent of flat panel display revenues), and are forecast to reach more than $20 billion (approximately 16 percent of the total display industry) by 2018.” While all of this sounds very promising we are only on the cusp of what OLED can offer us as consumers, and eventually in the digital signage universe as well.